CONGRATULATIONS Dawn Bolton on winning the book!! It’s always fun to see a friends new book come out and even more fun to get to read through it and create from it! 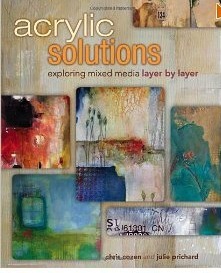 Chris Cozen and Julie Prichard’s new book, Acrylic Solutions is chock full of acrylic painting techniques. It covers the basic elements of art and has additional chapters on laying a good foundation, adding structure, developing complexity, and finishes with finessing the details. What I love about this book is the ability to use the information inside to create your own multi-layered mixed media art. It’s inspiring and helpful, but allows for personal interpretation so each piece is your own, no two alike. I hope it’s not too late!!! I want this book so so bad!!! Thanks for the opportunity & I love your work!!!! So sorry to miss entering for the workshop giveaway; this book has been on my wish list. Your painting ‘Elements’ is stunning. This book looks great! Thank you for a chance to win. I would love to win this book, amazing! I would say you achieved your goal with great A symetric spaces and the work moves your eye all over the piecce stopping to rest here and there with vingettes of texture, tone and line. It is amazing. Thank you so much for sharing the step by step process, I especially loved seeing the Gisella come to life. I am just starting acrylics. Happy heart. Thank you for being an inspiration to this newbie. This would be great always looking for inspiration. I teach high school art!! Would love to add this to my collection of your books. Really looking forward to taking your class at Random Arts in the fall. I love your work – as usual and the book looks fab! Thank you so much for sharing with us. Thank you for sharing your wonderful artwork. This sounds like a great book. Don’t know if this comment will show up more than once, sorry, new computer with touch screen. When I saw your first piece in the browns, I thought that was the finale and loved it. Then as I progressed down your page, and saw the progression of color, line, texture, letters, abstraction and then the warmth of blues, greens, and purples which I could never imagine seeing unless I was in some island, I would have never believed it. When I saw the first piece in the browns, I thought that was the finale! What a fantastic book – I would love to win it. Love the art pieces that you created. Great Book, Awesome artists, thanks for the chance to win. I’ve had my eye on this book. Love your art! That book looks brilliant. I love to see the piece progressions of other artist’s work. It is fascinating to see their processes. This book looks amazing! I can’t wait to get my hands on it! Awesome project, love the step by step and final result. Thanks for sharing and for the chance to win! The book looks brilliant, and I love your example, I would love to learn how to do that. thank you for the opportunity and as always the inspiration … i love the colors and showing us the process!!! I would absolutely love to win this fantastic looking book!!! I just took a Golden paint workshop, and am totally inspired by the versatility of acrylics! loved the painting progression. amazing evolution. Wow, those examples were great! Thanks for the chance to win a copy of the book! Great book! Loved your painting! Chris Cozen is such an inspiration to me! Thanks for offering this giveaway. Hi Pam, This book looks awesome, thanks for the chance to win. Pam, I love this piece, it is gorgeous! Oh, my. Such inspiring work. It would be great fun to learn from this book. this book looks like a must have! love the painting by the way. Wow! I really enjoyed seeing your process. Love the beautiful end result! That is an AWESOME piece. I have one of their earlier books and it has great information.Thanks for sharing. I would be sooooo happy to receive this awesome looking book!!!! What a great piece. Love those color wheels. Thanks for the give away. Can you see me over here! Jumping up and down, waving, and shouting ‘pick me! pick me please’! The book looks absolkutely fabulous. And I love your colour wheel stencils. I really like the layers of color, texture and pattern involved in this piece. The long narrow dimension fits the stencil and found object design very well and takes you on a trip from top to bottom. I’d love to use the book to make some dynamic pieces like this one. The stencil girl stencils are also super! That book looks terrific! ….. and it is great to follow the evolution of the piece from start to finish. Alas, no face, but I guess that’s ok too. This is such a beautiful piece. It’s minus a “Pam Carriker face”, but it has your style written all over it. I love it. I love that you have shown your process from beginning to final piece. The colours are great. Also a great idea to have the book spiral bound so that you can follow the book easily when trying out the skills. The process is as fascinating as the finish artwork. Beautiful color and depth. you shared the progression of this artwork. This looks like a beautiful book. Love the evolution. Pam, I love your art and for your giveaways …. I’d love to win Chris and Julie’s book! Blessings! I just love what you did with this piece, the inventiveness of using your style and their instructions – so much depth! What a nice Mother’s Day gift, thanks so much. Love the colors and design elements. It would be great fun to win the book – not to mention all the inspiration. I really enjoyed watching it unfold and loved seeing the ways you used your stencils. Awesome giveaway! Looks like a great book. I love your painting, and I look forward to owning the book, one way or another! I love that piece you created, and fascinating to see the various stages of it. Looks like a very interesting book! I love the example you created, and I’m excited about your “signature colors”! I’ve always been drawn to your color palette. I would love to win a copy of this book. Thanks for the chance to win. Step-outs are always so interesting. No one would have guessed some of the process the piece went through to become what it is. Thanks for sharing. The new book sounds as if it is very interesting also. Thank you so much for your generous offer. I would love to win the book. I’ve been exploring acrylics, collaging, dying tissue papers and making papers. I think this book would add more depth to my learning. Thanks, again, for the opportunity to get in on the drawing! I would be glad to win this book 🙂 I cross the fingers. Your painting in all the steps is fantastic. I would love to try this out with the book! Thank you for the giveaway! Looks like you learned the lessons well, beautiful work. Now I would like to win a book so I can create some beautiful work – thanks! So loved seeing your process. The final piece is beautiful, but some of the preliminary stages are also gorgeous! This book might inspire me to use my stencil club stencils – I love what you did with yours. Love seeing how your work evolves from beginning to end! Really liked the step-by-step example since I’m a ‘visual’ learner, along with the written commentary. Had already looked at example on Amazon, and really want this book in my collection. Thank you Pam! This budding artist is very appreciative of this post! Thank you so much for sharing your book related project and for the chance to win this copy. I am currently signed up for a painting class on 05/13/13 where I hope to gain and utilize new skills and products myself! Fun stuff! Your painting is awesome. Love how you used the stencils! Your painting is beautiful! I love all the layers and texture. I’d love to win a copy if the book. Thank you for the opportunity! This looks like an awesome book!!!! Thanks for the opportunity to win! looks like a fabulous book! The colors are amazing! I am so inspired by your mixed media techniques and would love to learn more about leveraging Acrylic painting techniques. This book looks wonderful! I would love to win this book! It looks awesome! Your adaptation of creating a work of art is really cool! Thanks for the chance to win! I do so appreciate the fact you have shown progression photos of your art, thank you so much for sharing. Looks like an excellent book. I will keep my fingers crossed to win this, but either way, this book needs to be in my collection! I would love this book and am an art teacher. It would really be a great resource and thank you for the opportunity! This piece of art is very interesting. And I am very impressed! But also totally ignorant of these techniques. The result is magnificent!!! I love the way your painting turned out! The colors are vibrant and perfect! The book looks wonderful – winning it would make a very nice Mother’s Day present!! Love how you used your circular stencils. They’re definitely on my wish list. The book sounds like it would be a great “return to” addition to any artist using acrylics. I always need tips on how to use this medium. This book looks right up my alley…thanks. How fun to see the layers in your piece evolve. Thanks for the chance to win. How fun to see the many layers of your piece as it evolved. Thanks for the chance to win. Thanks so much for showing your process and progress – it’s just fascinating to me how a painting develops! This looks like a book that should be on every artist’s bookshelf……so my fingers are crossed! Thanks for sharing! Wow, this book sounds fantastic! Your work, as always, is amazing! Thanks for sharing your process, and for the great give away. Talk about feeding our muse! Those examples are great “eye candy.” I am taking a class with Chris Cozen (and you) at CREATE at the end of the month. Thanks for the opportunity to win this amazing book. omg…..so much fun…so little time….thanks for the offer…crossing my fingers…. Your book looks awesome, would love to be the winner! Beautiful! I can’t wait to see all of the goodies inside the pages of the book! I love your work and what you’ve done in the steps on this piece are wonderful. I hope I win the book as it looks like I could learn a lot from these ideas. Great to see your painting unfold. I would love to win the book. Your website is very inspiring. What an awesome Mother’s Day gift, the gift that you can use over an over. You gotta love that. am just starting to learn about acrylics – would love to win the book! Wow, so cool to see the evolution as your unique style emerges…very inspiring! I have taken one of Chris and Julie’s online workshops and would LOVE to get my hands on their book as well! Impressive! Love to get that book. Impressive !! Love to get the book. Lovely…looks like you had LOTS of fun! OMG! This book is sooo yummy!!!!!!!!! Can’t wait to have in it my hands so I can look through it! This looks like a great book for myself and my daughter, we both would learn a lot from it. Its amazing to see where this piece begins and then what it becomes in the end. This book sounds very intriguing and I’m excited to check it out! Acrylic is my favorite paint medium and I’m looking to expand my use of it. Getting this book for free would be excellent! If not, I will certainly support the author with a purchase. Your application of the techniques turned out gorgeous and I’m truly inspired! There’s a ton of depth and I am now aching even more to purchase the color wheel stencils. Beautiful rich colors as well! Oh wow, this is exactly the book I need. I am new to mixed media and I have so much to learn. It would be fantastic to win this book!!! Thanks for the giveaway ♥. Awesome painting! Love the composition and colors! Great giveaway! Thanks! I love the process, thank you for sharing. The book looks so interesting. Love the use of your color wheel stencils. This book is timely….just where iam at..need more info about acrylics. WOW! I was really surprised at the evolution a couple of times! The end result is amazingly beautiful! Love Love Love! And this book has been on my wish list since before it came out. Wow Pam, from your crit that book sounds like a great buy … hope I get to be a lucky number! I have used their YouTube presentation of how to paint a background without it turning into mud and loved how it came out!! This book would be a great addition to further my art skills. Thank you! I’ve always wanted to learn more about Acrylic textures and layers for artwork! Pick me! this is completely spectacular! LOVE it! awesome to see the evolution of the piece. Loved those examples all the way through. The warmth draws me in. Also thanks for the news on your medium too. So glad I can get it now.